This year for Healthy Heart Month 2017 the campaign focused on Stroke Prevention. 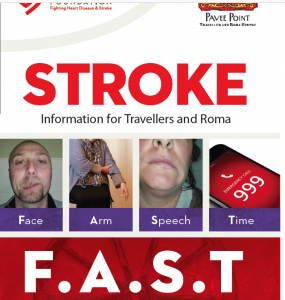 Our Primary Health Care for Travellers Project (PHCTP) distributed resources and held a stroke information session. 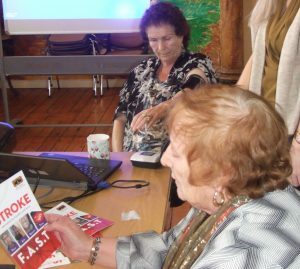 As high blood pressure is a major cause of stroke (4 out of 10 Travellers have high blood pressure) the PHCTP also organised blood pressure checks with the PHN and have organised for the Irish Heart mobile unit to visit sites next month. Information session on weaning with Public Health Nurse Jemma Guiney. 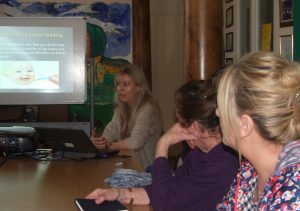 Public Health Nurse Jemma Guiney, facilitated an information session with the PHCTP on weaning. Community Health Workers found the morning very informative, particularly in relation to the current guidelines stating that you should wait until your baby is six months of age before you begin spoon feeding, and definitely not before seventeen weeks. See HSE Weaning Guide.